I am looking for advice from those that have traveled this road. I want to lower and stiffen my 2000 Boxster as it is going the way of dedicated track car. Currently considering H&R springs and Bilstein struts and shocks from Tire Rack. Any thoughts or advice? That is how mine is set up. You should look at camber plates for the front also. I do run the Tarret GT3 Front sway bar and their Rear Boxster sway bar. Not bad on the street and drives well on the track. ditto on the sways. not sure you want to go any lower if you already have lowering springs in the car. I installed the Eibach sport sway bars front and rear. Rear has 3 holes for adjustability, I put it on the middle hole. Rest of suspension is stock. Wheels are 17 in staggered Boxster twists with Hankook Ventus RS-3s. I was able to get 1.8 neg camber on rear wheels. Fronts I slotted and got -2.0 degrees camber. I didn't want to do the camber plates that lifts the front some more, and I didn't want to spend $$$ with adjustable LCAs, or $2.5K on PSS9 coilovers. Iconsidered lowering springs, but concluded that those springs are not meant to work with the stock strut. I drive this car to work occasionally, so I didn't want to lower it. I have 2 DEs and 1 AutoX on this setup, and I can tell you that sway bars made a HUGE improvement. Much less body roll, more grip, quicker response. The front camber also made a significant improvement, especially at the AutoX and more uniform tire wear. Last edited by AZ986S; 01-31-2017 at 01:52 PM. Fronts I slotted and got -2.0 degrees camber. If you took any pics during the process you should make a DIY it would be good info to have. Glad for the info on the Eibach bars as well. I ran just the rear bar for a while, sounds like I probably should have gotten the full set. We really need to know more info in order to point you in the right direction. How much track experience do you have? What are your goals with the car - a few DE's a year or Spec Boxster racing? Will you still drive it on the street as a daily driver or do you want the most performance for the track? What is your rough budget for this upgrade? On track days, I just loosen the 3 nuts, pry over the strut to the marked position for -2.0 degrees camber, then torque down the 3 nuts again. I understand that adding more neg camber will add some toe out, but my initial alignment was set with 0.10 deg toe in, so I bet I was neutral toe in the front at -2.0 neg camber, right where you would want it. Last edited by AZ986S; 01-31-2017 at 07:38 PM. If you drop the car's ride height with coilovers (recommended for track use) be sure to AVOID using Top Speed adjustable control arms to bring it back into alignment. They're made of steel and quite heavy, and the welds leave a lot to be desired. So what does this mean? It means you're going to spend a wad of money on good quality suspension arms from Tarrett Engineering or another expensive source. With the camber plates, I got -2.2 front camber. The camber plates also have momoballs, so it is much tighter than the stock rubber bushings. Jason @ warehouse 33 auto . Com (remove spaces) can get you a good deal on Tarett camber plates. Just did 2 track days and it was amazing! Last edited by JayG; 10-20-2017 at 05:38 AM. Using a Dremel style air took my front slots were widened just 5mm and can get approaching -2.5 deg on my standard M030. Is anyone else using this set-up? The shocks/struts have 5 settings. Trying to determine optimum settings and alignment specs. Have also added Recaro SPG XL seats and Schroth 6 point harnesses. 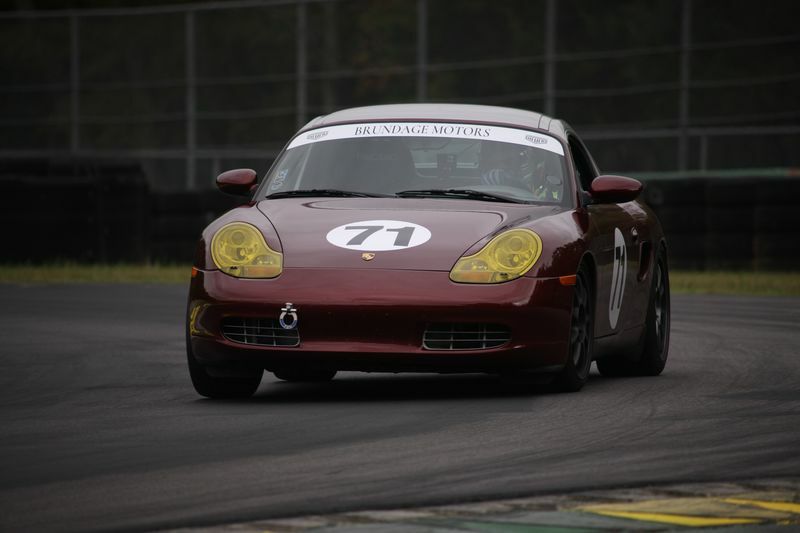 Tested the car at VIR last Thursday and very happy with the upgrades, trying to now dial it in. Here is a picture of the car exiting Oak Tree at VIR. Oh wow, I just looked up the adjustment procedure for the Koni Sport Rear for the 986 Boxster, you really do have to remove them from the car to adjust. How do you know what setting to put them on to start? I think several track folks on here have those, @jakeru - what setting do you have your rear Koni sports and how did you decide on it? I actually haven't installed my Koni sports on the rear yet. Plan to tackle at some point, along with rebuilding rear cv boots, and maybe a clutch job. But based on other experiences with Koni sports (including knob-adjustable and "remove, compress fully and twist" to adjust style (such as found on the 986 rears), these "off the shelf" shocks are typically engineered to give OE spring (non-M030) stiffness optimized performance in "full soft" (fully counter clockwise) setting, and cover traditional aftermarket lowering type spring rate dampening duty when turned in about halfway or a bit more, say at about +1 to +1.5 turn. The specific tunings of the shocks from model to model will of course vary, and truth be told, in my opinion based on lots of suspension tuning and shock adjustments for several cars running Koons, including some competing successfully at national-level SCCA solo competition, the most important thing the adjustable Koni sport setup can provide, in my opinion, is to be able to dial-in the ratio of front to rear roll stiffness (or "roll coupling"), and all you need to do this is for one end of the car to be adjustable (e.g. Externally knob-adjustable to "dial in" based on iterative feedback), as long as you don't run the shock adjuster all the way into the full soft or full stiff limits of the adjuster (and still need to go further ), you can always dial that one adjustable end of the car in as needed to optimize the front-rear roll couple and achieve the desirable neutral handling characteristic. That should give you some leeway to adjust the other (front) end, either in the softer direction (to counter too much push or understeer, and promote tail-end rotation), or firmer (to tame a tail-happiness and tendency for car to spin/oversteer). And you would do this as often and iteratively as you'd like, since adjustments are so accessible. You can easily adjust them them to make fine-tuning adjustments required for different tires, tire wear, tire pressures, or suspension alignment configurations, any change you make tot he car that upsets the front-rear weight bias, or front or rear spring rate, etc. Sure, you can get fancy adjusting shocks in many other differemt ways, e.g., double or triple adjustable and independent rebound and compression, and spend thousands of dollars on such a setup, but IMO, thie basically ability to dial in basic understeer/oversteer with turn of a couple knobs (accessible at front under the frunk) is a huge benefit for performance application, IMO, and the inexpensive, off-the-shelf rebound adjustable Koni sports really economically deliver on this benefit. The reason I don't suggest setting up the "hard to adjust" rears up +0 turns under any situation, at least from the get-go, is you run more risk of having a situation of excessive push (understeer) that you can't easily dial out by adjusting the fronts (particularly, once you adjust the fronts to full soft, you run out of ability to adjust them any further softer, and assuming Koni tuned the shocks roughly correctly, there is a good chance you would be running the fronts at around very close to full soft, so you're risking running into the adjuster's limit if you seek to dial-in or fine-tune. Just my 2c, opinions may vary, this is a short-cut / generalization... hope it helps, though! Last edited by jakeru; 10-18-2017 at 10:47 PM. Jakreru - that was a very interesting and educational read, thank you! @jakeru very helpful thank you! Mine were installed "out of the box" with no adjustment, bad mistake. 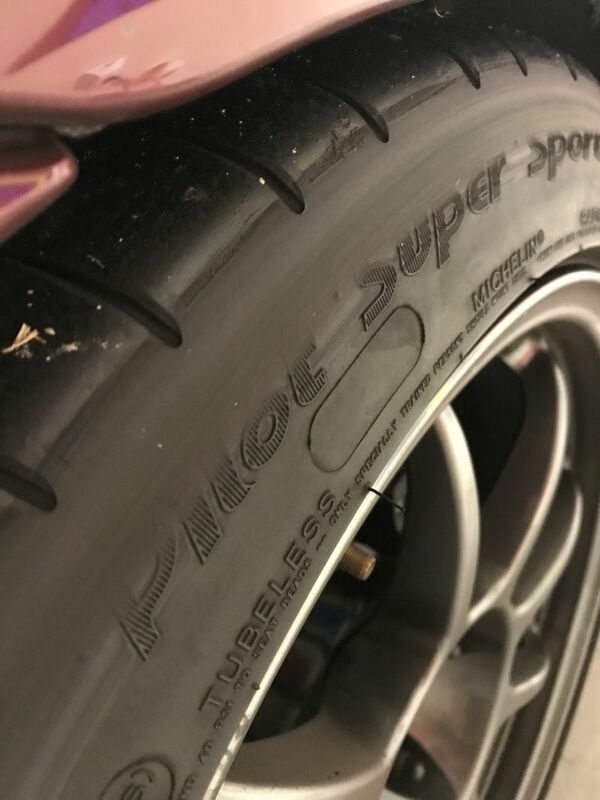 During 200+ track miles at VIR last week I realized my right rear had approximately 3" travel and was rubbing the New Michelin horribly, left rear was acceptable. Thinking at this point the right rear strut is full soft, actually hoping that is the issue. Here is a picture of the right rear tire after VIR. According to Koni, the default position out of the box is full soft - 3rd FAQ from here - so you are probably OK with the default setting, unless somebody played with it before it got to you. "What is the best adjustment setting for my shocks? - For most vehicles, we suggest that new KONIs be installed in the full soft position. (the standard setting right out of the box)"
I was just thinking - they are rebound adjustable and not compression adjustable? Wouldn't compression control the rate of spring compression and contribute to the distance of compression? "Bump [compression] damping controls the unsprung weight of the vehicle (wheels, axles, etc.). It controls the upward movement of the suspension such as hitting a bump in the track. It should not be used to control the downward movement of the vehicle when it encounters dips. Also, it should not be used to control roll or bottoming." "The rebound damping controls the transitional roll (lean) as when entering a turn. It does not limit the total amount of roll; it does limit how fast this total roll angle is achieved. How much the vehicle actually leans is determined by other things such as spring rate, sway bars, roll center heights, etc." I concur with what is said, but in a pinch when handling balance adjustment is needed, there is nothing faster than adjusting an accessible (pair of) knobs to change the rebound setting at one end of the vehicle. It's faster than changing springs, faster than changing swaybars. If you have adjustable swaybars where the adjustment mechanism is petty easily accessible, that would be the exception, but many cars don't provide this, or they're still a hassle to quickly adjust even when they are present, and you can still fine-tune dynamics further (e.g., refine specific handling issues only occurring at corner entry or corner exit) using adjustable shocks. Many people use alignment settings and tire pressure changes alone to achieve the neutral handling balance adjustment, and tire pressure are certainly about as convenient and quick to change as knob-rebound adjustable shocks are. However, assuming you start out from a setting with optimal tire grip from optimal tire pressures and optimal alignment (especially camber), any tire pressure adjustment you do to deviate from that to "fix" neutral handling will give less overall grip than making an adjustment to the relative front/rear roll couple. Adjusting the roll couple will basically harness the grip of the better-gripping end of the vehicle to help out the more poorly performing end of the vehicle. It does this by reducing the lateral weight transfer at the more poorly performing end, and redirecting that lateral weight transfer to the better performing end. This is all because reducing lateral weight transfer at one end of a vehicle increases grip, while increasing weight transfer at an end of the vehicle reduces grip. And that's all due to an interesting property seemingly inherent to pretty much all pneumatic tires, which is the coefficient of friction of a pneumatic tire seems to be always better at lower loads, and always worse at higher loads. The converse side of this coin is that reducing lateral weight transfer increases grip, so that's why being able to fine-tune the front/rear roll couple is essential to be able to fine-tune a neutral handling characteristic without sacrificing overall grip. Last edited by jakeru; 10-20-2017 at 06:55 PM. I've been running my setup M030 ROW with camber plates for about 9 months now and it feels great. No perceptible odd tire wear as well in about 7000 miles on the setup. Maxed out front and rear camber, no toe in front and a smidgen in the back. Last edited by JayG; 10-20-2017 at 05:46 AM. I think the article is saying that bump and rebound are two different settings, but in your quote it looks like they are the same? Should the word rebound be replaced with compression? in the above sentence?